This entry was published on March 30, 2018. This Topic is also available in the following editions: DiBiase, D., DeMers, M., Johnson, A., Kemp, K., Luck, A. T., Plewe, B., and Wentz, E. (2006). Organizational Models for GIS Management. The Geographic Information Science & Technology Body of Knowledge. Washington, DC: Association of American Geographers. (2nd Quarter 2016, first digital). GIS was considered a niche technology when originally implemented in selected organizations in the middle 1970s to mid-1980s. Today, GIS has become an accepted information technology tool used by a wide range of public-sector organizations, public and private utility organizations, private companies, academic institutions, not-for-profit groups, and a range of non-governmental organizations (Table 1). Depends upon legal and administrative structure of organization or parent body. Usually includes a governing board of directors and appointed senior officer (e.g., CEO, general secretary, president, executive director). * Identifies the legal, regulatory, or other formal basis and executive leadership for the establishment and operation of the organization. shared data, applications, and support. At the same time, many GIS programs have a scope that now includes users from outside of the organizational boundaries, in order to support a variety of collaborative efforts such as joint funding and data sharing with external organizations and user groups. This expanding domain of GIS operations tends to blur strict organizational lines and has required GIS managers to put in place creative legal, financial, and administrative mechanisms to support collaboration within and external to the organization. For additional information on the history of GIS and its management issues impacting GIS implementation and operation, see Foresman, 1997; Wellar, 2012; and Kuhn & Onsrud, 2018. Decisions about organizational placement and management of GIS programs and projects must first consider the organization’s overall structure. Organizational structures establish a consistent and efficient way to direct resources, convey information, comply with formal requirements, and ultimately accomplish the organization’s mission. Common structure models include hierarchical (also referred to as “bureaucratic” or “functional”), matrix, and project-oriented (Figure 1). In practice, one of these organizational structure types may dominate but they often incorporate elements of the other organizational types. Strict vertical (top-down) lines of authority. Clear “unity of command “(each organizational unit has one defined manager). Organizational unit groupings typically defined by business or workflow responsibility. Lack of formal horizontal lines of communication between units at the same level. Predominant structure for government, military, utility companies, and many private firms. Many hierarchical structures incorporate “staff” and “line” organizational units. Staff units connect directly to the chief executive office to play organization-wide support roles (e.g., legal, financial). Line departments address operational activities. 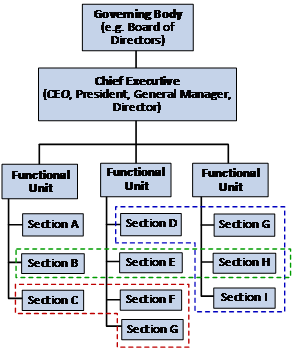 Most organizations with a predominant hierarchical structure incorporate some features of matrix structures (see below). Underlying hierarchical structure with formal means for horizontal collaboration (lateral linkages) to create work teams that cross vertical authority lines. Characterized by horizontal groupings (project teams, committees, task forces) created to take advantage of competencies across organizations. Organizational units organized under “functional unit” groups that may be defined by type of product, service, customer or geographic characteristics. May violate strict “unity of command” principles and vertical lines of authority. A single employee may answer to more than one superior. Little formal lines of horizontal communication between units. Typical structure for private services firms or non-profit organizations. Private technical services companies often use this structure to define vertical lines of business but to allow for cross-departmental project or research activities (to make use of staff and resources most suited to the job). 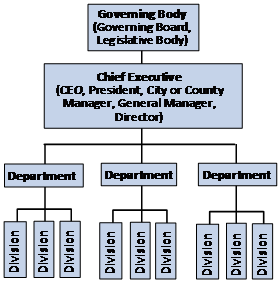 Many organizations predominantly structured as hierarchical (e.g., governments) have some elements of matrix structure (e.g., some local governments assign assistant city or county managers to top-level functional units defined by service area). Project managers or project steering groups oversee the work of one or more teams. Teams are composed of people who may be placed anywhere in the organization, and one person may be a member of more than one team. Project managers responsible for overseeing and reporting performance to senior management. Organization may have a “project management office” that establishes standards and procedures for project planning and execution and that may have a role in performance monitoring. Structure used by services firms, research institutions, R&D arms of private companies, and some non-profit groups that are oriented around project-based work. Figure 1. 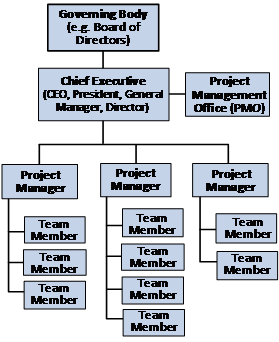 Management scientists including Mintzberg (1979) and Melin (2010) categorize administrative organizational structures into types such as hierarchical, matrix, and project-based ones. Examples of GIS integration and enterprise GIS can be found within each of these organizational structures. In the 21st century, organizations are finding it necessary to evolve to become more flexible and collaborative and remain competitive. Organizations are taking greater advantage of technologies for communication and coordination and worker lifestyle. This trend is resulting in less rigid management controls, the location of workers (remote location and worker mobility), increased collaboration in the workplace, and more routine formation of collaborative teams with participants from through an organization. Organizational management has now become its own distinct discipline (Fayol, 1949; Drucker, 1973; Moore, 1995). For the purposes of this chapter, organizational management is defined as the planning, organization, coordination, and oversight of activities, people, and resources for the achievement of defined objectives. Sound GIS management requires the efficient use of resources and effective planning and execution of tasks to deliver value to users and “customers” of GIS products and services inside and outside of the organization. GIS management is relevant at multiple levels, from the organizational to the program to the project. URISA’s Geospatial Management Competency Model (GMCM), which addresses the management competencies of the U.S. Department of Labor’s Geospatial Technology Competency Model (GTCM), is directly relevant for management within this domain. 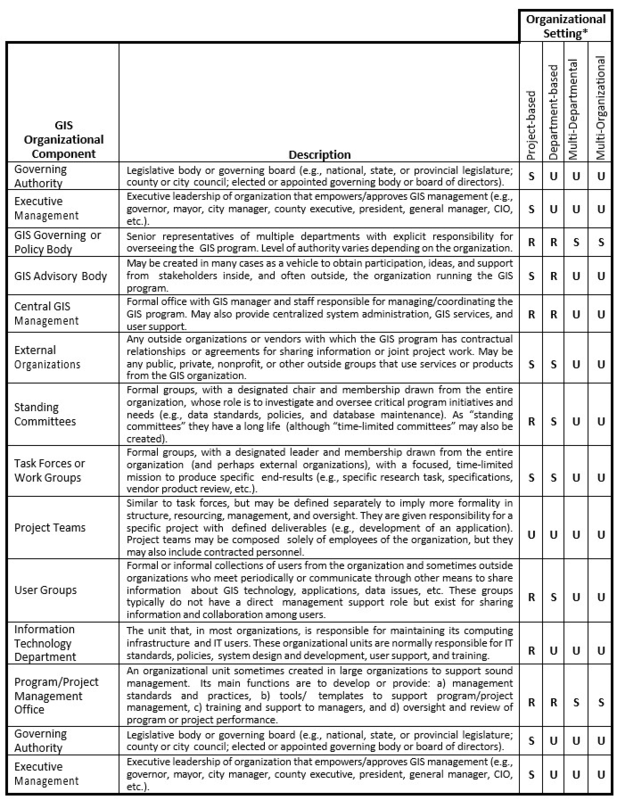 The numerous competencies of the GMCM, listed below in an edited list, presents a comprehensive scope of GIS management responsibilities and activities, whether the focus is at the program or project level. A well-crafted strategic plan is a good foundation for all management activity. Strategic plans define direction and act as a compass to help programs and projects stay on track, maintain alignment with overall organizational goals and needs, and serve as a basis for assessing and reporting on status and progress. GIS management strategic plans should be brief while still adequately describing 1) the GIS-related organizational mission and goals, 2) information about services to users, 3) major initiatives for GIS development and enhancement work, and 4) how GIS supports the organization's mission and business needs. Strategic plans often span 3-5 years, and while there may be minor revisions from year-to-year, the strategic plan should not be changed substantially during this planning period, unless necessary. Table 2 contains suggested content and format for a GIS strategic plan. For further information, see Somers, 2000; Haack, 2002; Bryson, 2004; and Croswell, 2009. Current Situation and Organizational Context: A summary of the current business and organizational environment, system resources and standards, and status of GIS activities. Organizational context, GIS users, and stakeholders. Strategic Foundation: Key pieces that provide a basis for action and create a picture of the end result to be achieved through this plan. This major part of the plan includes concise high-level goals and establishes a business justification for accomplishing those goals. Strategic Initiatives: Elaborates on high-level goals and provides more specific information on particular actions to accomplish the goals. While still high-level, this part of the plan provides sufficient detail to define the nature of the work, the overall timing, and the resources necessary. GIS “stakeholders” are individuals or groups that have some interest in the development and operation of the GIS program or products generated from the GIS. Effective GIS project and program management is attuned to these different GIS stakeholder roles, and the roles are specified and differentiated in the strategic plan. GIS managers: Individuals or bodies with a formal or informal role in planning, managing, overseeing, or coordinating GIS programs and projects. This may include formal bodies created to support GIS project and program management and coordination (e.g., GIS Steering Committee). GIS/IT technical staff: Individuals with technical skills and roles in GIS program development and operations. Includes responsibilities in such areas as GIS database development and administration, software/application development, system and network administration, and other technical areas. Direct GIS users: Individuals or groups that directly access GIS software and applications to support their organization’s needs. These users may be involved in such activities in GIS data collection, GIS database update and quality control, direct use of GIS software and applications to generate to generate products or results, or use of a software or Web service integrated with GIS (e.g., infrastructure asset management system). This stakeholder group also includes a wide array of “external users” not part of the organization hosting the GIS but which access GIS data and tools by public facing Web-based applications, mobile apps, and a range of location-based services. Indirect GIS users: Individuals and groups that have access to products generated from a GIS (e.g., map) but do not access GIS software or data directly. Organization management: Mid-level or senior managers in organizations that have a role in overseeing GIS operations, approving resources for GIS, or which have other decision-making responsibilities that impact GIS programs and products. This stakeholder category may also include high-level bodies (e.g. GIS or IT policy board) that have oversight responsibilities over GIS programs or projects. External partners: Outside organizations, with which the organization running the GIS program collaborates, normally through a formal agreement. These external relationships may involve sharing of data, funding support for GIS development or operations, or other relationship. For example, in the USA and Canada, there are well-established multi-organizational consortia (multiple local government jurisdictions and utility organizations) which provide benefits for all parties. Product/service providers: Includes any parties, most frequently private companies, which provide GIS programs with an array of products (e.g., GIS software and hardware) and services. Services provided including consulting, GIS database development and integration, application development, Cloud-based or hosted GIS services, etc. Where in the organizational structure should the GIS management office be placed? What is the appropriate level of centralization of GIS services? Many GIS programs operate as an organizational unit (“office”, “division”, “department,” “center”, etc.) inside a parent organization, and they adhere and respond to the established lines of authority and management controls that exist in that organization. Today, most GIS programs are established to serve a broad user community both inside and outside the host organization, and this has implications for placement of the unit. No single optimal approach to GIS organizational structures has emerged in practice. The dominant trend recently has been to put in place more centralized mechanisms for coordination, collaboration, and management in multi-departmental and multi-organizational settings. It is also common to place GIS management inside the main information technology department. communication and coordination with external GIS stakeholder organizations. However, the most appropriate placement depends on many factors such as the type and size of organization, the nature and size of the GIS user community, the geographic distribution of users, the organizational culture and history, and existing organizational policies (Table 3). Senior Executive Office: Special management position or office inside the senior executive management office of an organization (e.g., Mayor or City Manager’s Office) Advantages: a) Can use existing lines of authority for communication and management control of entire organization; b) Effective way to maintain awareness and support from chief executive. Disadvantages: a) Technology management not always a normal role of the executive office, resulting in less effective oversight; b) In some cases, lines of communication can result in disconnect with user departments. User Department: Placement inside a line department or office in the organization that is a principal user of GIS and which has been assigned a role for organization-wide GIS coordination and management. Advantages: a) Line department may have a strong history of GIS use and support; b) GIS can take advantage of reliable revenue. Disadvantages: a) Objective to fulfill department's mission may conflict with organization-wide GIS needs and support to other departments; b) Line of authority and political perception may inhibit organization-wide participation. Independent Public Entity: Approach for GIS in public-sector agencies in which GIS management is assigned to an existing or newly created autonomous organization, not directly managed by or in the line of authority of the organization(s) that it serves. The autonomous organization would be formally created by the user organization(s) and has the oversight of a governing board. Advantages: a) Level of independence allows focus on GIS program needs, b) Greater management and operational flexibility (staffing, decision-making, budgeting, resource allocation).Disadvantages: a) Legal/Administrative complexity to create, b) Start-up costs can be high, c) Lack of direct lines of authority with user departments can impact acceptance of management decisions, d) Separation from user organization can make it more difficult to secure funding sources, e) independence makes it more difficult to share administrative resources and costs (e.g., clerical, financial management) with a parent organization. Outsourced to External Contractor: All or some GIS management and coordination functions are assigned to an external group (e.g., private company, public agency, or non-profit organization) with terms established through a formal contract. Advantages: a) Contract terms clearly define management and operational support role and duties, b) Greater management and operational flexibility (staffing, decision-making, budgeting, and resource allocation), c) Can open up new channels for revenue not readily available to public agencies. Disadvantages: a) Legal/Administrative/Policy complexity and obstacles, b) Lack of direct lines of authority with user departments can impact acceptance of management decisions, c) Separation from user organization can make it more difficult to secure funding sources. For further discussion of issues regarding organizational structures and placement, consult Brown & Friedley, 1988; Edwards, 1990; French & Skiles, 1996; De Man, 2000; Pornon, 2002; Somers, 2004; Nedovic-Budic, 2005; Obermeyer & Pinto, 2007; Croswell, 2009; and Tomlinson, 2013. In most cases, multi-organizational GIS programs have formal agreements (e.g., inter-local agreement, memorandum of agreement) that define terms for participation, data sharing, and other types of collaboration. Some multi-organizational GIS programs have no designated lead organization or management body but do include advisory bodies (without direct management authority) which develop collaboration policies and support communication among parties. Most multi-organizational GIS programs assign management and administrative responsibilities to one of the participating organizations. These lead organizations often include staff that support users in the participating organizations and have a range of operational responsibilities that might include: maintenance of a central GIS data repository, software license management, oversight on GIS policies and standards. These multi-organizational GIS programs normally have a high-level oversight body, with representatives from the participating organizations—which may or may not have management authority on GIS operations. There are a small number of multi-organizational GIS programs which have formed a GIS management office—with a manager and staff, which operates independently of any of the participating organizations but which supports the program and provides support for users in all the organizations. For additional information on multi-organizational GIS management factors such as structure and coordination, governance, and financing, see Geodata Aliance, 2001; Johnson & Nedovic-Budic, 2002; Pornon, 2002; Nedovic-Budic, 2005; GITA, 2006; Obermeyer & Pinto, 2006; and NASCIO, 2012; as well as the full Croswell survey report (Croswell, 2015). GIS programs are more or less likely to contain certain organizational components depending on the settings within which the programs are based (Table 4). These settings can vary in complexity from focused “project-based” GIS with limited scope and “multi-organizational” settings with high complexity and a large, diverse user community. 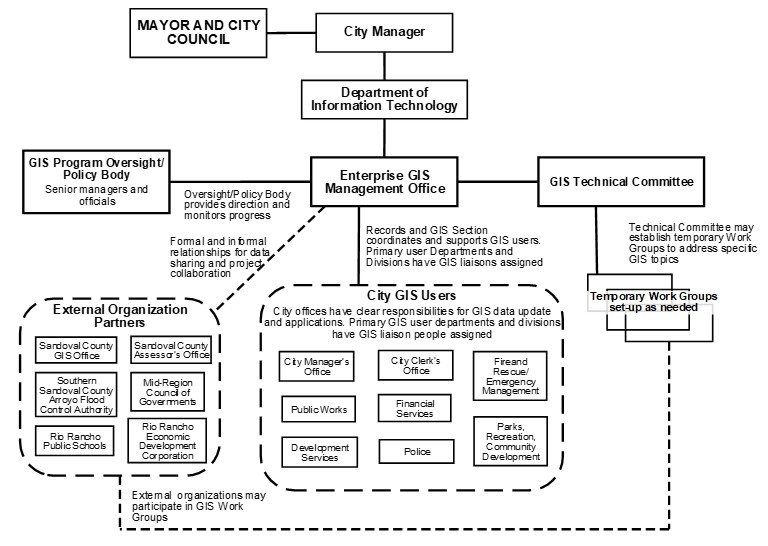 Below we detail with an organizational chart one hypothetic but realistic scenario in which an Enterprise GIS office is placed inside a City’s Information Technology Department (Figure 2). This office would have responsibility for managing the GIS program and supporting users in all City departments and coordinating with external organizations for sharing of data and access to the GIS. To fully appreciate all of the relationships among stakeholders, all GIS program management efforts should be able to produce organizational charts such as this one in order to appreciate the relationships and dependencies. Figure 2. Enterprise GIS Organizational Structure for a Municipality. Any successful GIS program that serves multiple user groups must provide and respond to a range of coordination and management needs and operational roles and functions. How these roles and functions might be allocated to various parties, e.g., assigned to a central GIS management office, decentralized to one or more user departments, or outsourced through a contract with a private company or other outside service provider, are key decisions. Table 5 below details the responsibilities for an enterprise GIS program with a high level of centralization, a combination that is especially common in government and utility organizations. departmental collaborating fosters innovation and better customer service. The goal is to establish a mix of centralization and decentralization that is optimal for that organization to maximize coordination and sharing of resources, as well as quality of service to users. The degree of centralization influences the size of the central GIS management office and the make-up of its staff, as well as the type and number of GIS staff retained by user departments. Some organizations with enterprise GIS programs have relatively modest staffs, including a GIS manager or coordinator, a small number of technical staff, and administrative support personnel. In other cases, central GIS management offices have sizable staffs and have assumed a comprehensive range of roles in program administration, coordination, technical support, and operations. More discussion of staffing levels and roles for GIS programs are covered in Tomaselli, 2007; Croswell 2009; Butler, 2013; and Tomlinson, 2013.
the importance of 24/7 operations and services to users. These advances in technology have created expanded demands on GIS program management by increasing a) the size of the user community inside and outside the host organization, b) the need for high-quality, updated data, and c) the complexity and operational integrity of system configurations (hardware, software, and networks). Recent literature that describes these and additional GIS technology trends include Kouyoumijian, 2011; Huang et al, 2013; Scassa, 2013, Cho, 2014; UNGGIM, 2015; CDG, 2015; Datta, 2017; Bauman, 2010; and Agrios & Mann, 2010. Other relevant sources and resources for understanding organizational and technological influences include the The Open Source Geospatial Foundation and the Federal government's Citizen Science Toolkit. Along with applicable laws and regulations from governmental authorities, GIS programs and their organizations traditionally rely on written policies as a basis for their operation. A well-managed GIS program should have clearly articulated, easily accessible, and regularly revisited written policies that cover such topics those listed below. Personnel and professional development: Policies that reference existing personnel policies, as well as any additional ones related to ethics and professional development that specifically affect IT and GIS management and use. Standards compliance: Policies that identify approved technical standards and clarify how they apply. Contract and financial management: Policies that define authority and procedures for budgeting, entering into contracts with private firms, and procedures for managing contracts. Project coordination and management: Policies that define requirements for projects and all elements of managing and monitoring progress, directing team activities, and project reporting. GIS participation and project partnerships: Policies that define procedures and administrative instruments for identifying and “registering” GIS users and participants, both internal and external, and for entering into partnerships for joint project work with outside organizations. Data/product access and sharing: Policies that govern access rights to the GIS, specific agreements for data sharing and data distribution limitations, and legal issues for data and product distribution. System administration and network security: Policies that direct the use of technical tools and practices for system operation, system monitoring, network security, and all aspects of system and database administration. User support and help desk services: Policies that define the nature and extent of support provided by the GIS management and technical support staff or other designated parties and procedures through which users can access support or services. Data maintenance procedures and responsibilities: Defines accepted policies for update of GIS data elements and specific procedures and responsibilities for carrying out the update and posting data for general access. Includes procedures for users to report data errors and problems found during routine GIS use. External communications: Procedures and protocols that govern any external communications about the GIS program, including contacts; collaboration with other agencies; media relations and formal press releases; participation in public communication forums; publications; and other external communications activities. A common unit of activity within GIS programs is a GIS project. The Project Management Institute (PMI) defines a “project” as a “temporary endeavor undertaken to create a unique product or service.” In addition to providing routine, ongoing services to the user community as projects, GIS programs also manage their own internal and ongoing projects, such as database improvements, custom application development, GIS integration with external systems. The PMI has its own Project Management Body of Knowledge which is an excellent resource for all types of projects, including GIS ones. 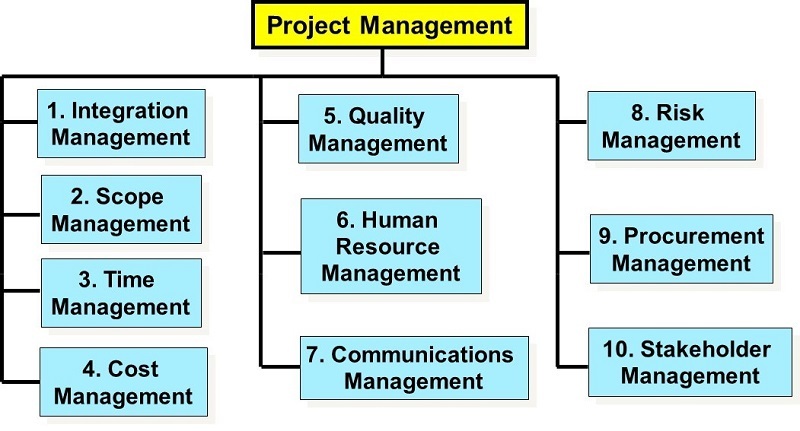 The PMI defines “project management” as “the application of knowledge, skills, tools, and techniques to project activities to meet requirements” and they also detail project management “knowledge areas” (Figure 3). Each of the PMI’s project management knowledge areas are often implemented within GIS projects. Figure 3. The Knowledge Areas of the Project Management Institute. 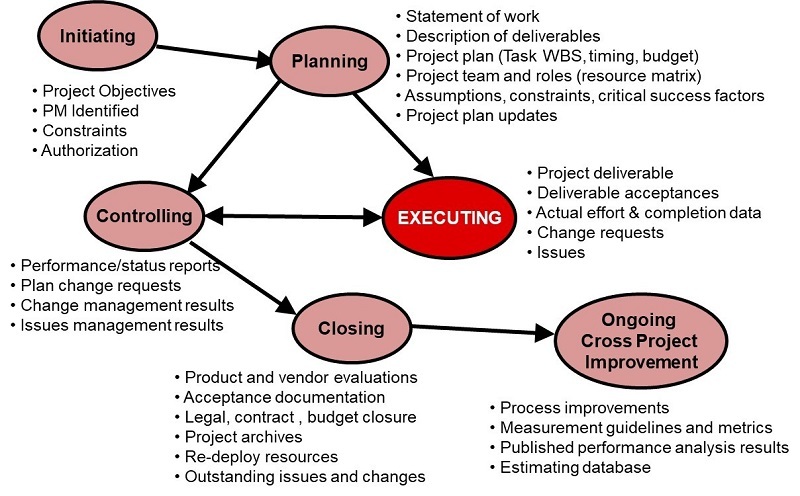 The PMI defines and endorses effective standards and practices including a set of “process elements” which provide a framework for the full lifecycle in project initiation, planning, execution, and closure (Figure 4). These process elements, along with the PMI’s knowledge areas, provide an effective structure for GIS project planning and management. Figure 4. Project Management Process Elements, as defined by the Project Management Institute. Source: adapted from Figure 2.1, Project Management Process Groups, GEOG 771: Geospatial Technology Project Management course, Penn State University. Project planning and management is a routine aspect of GIS programs. In addition to ongoing, routine management and support for users, GIS staff carry out special projects on a regular basis. Typical projects for GIS programs include GIS database development or enhancement, major software migration and configuration, development and delivery of training, custom GIS application design and development, and integration of GIS with external systems and databases. For additional information on GIS project management including approaches and best practices for planning and executing GIS in a way that delivers results and supports the overall GIS program mission and goals, see Wilder & Brinkerhoff, 2003; Fournier, 2007, 2008; and Croswell, 2009. Agrios, B., & Mann, K. (2010). Getting in touch with volunteered geographic information. ArcUser, Vol. 13(3), 20-21. Babinski, G. (2009). GIS as an enterprise municipal system. Government Finance Review, February, 2009, 22-30. Bauman, J. (2010). The role of volunteered geographic information in a postmodern GIS world. ArcUser, 14(2), 20-21. Bradbard, D., Fuller, B., & Townsend, B. (2017). Geographic information systems in selected cities and counties in the southeast United States. URISA Journal, 27(2), 5-20. Brown, P., & Friedley, D. (1988). Assessing organizational preparedness for a comprehensive, distributed LIS/GIS. Proceedings of the 1988 Annual URISA Conference, 3, 22-36. Bryson, J. (2004). Strategic Planning for Public and Non-profit Organizations, Jossey-Bass. Butler, A. (2013). Model GIS Job Descriptions, 2nd Edition. Special publication of the Urban and Regional Information Systems Association (URISA). Available online at www.urisa.org/resources/books-and-resources/#modeljobs. Cho, G. (2014). Some legal concerns with the use of crowd-sourced geospatial information. 7th IGRSM International Remote Sensing & GIS Conference and Exhibition, IOP Conf. Series: Earth and Environmental Science 20. CDG. (2015). 24/7 government: Enabling access to critical services anytime, anywhere. Folsom, California: Center for Digital Government, Q1. Dearing, A. (2017). IOT and the move to open source GIS. Directions Magazine, May 17, 2017. Drucker, P. F. (1973). Management: Tasks, Responsibilities, Practices. Harper and Row Publishers. Fayol, H. (1949). General and Industrial Management, Pitman Publishing Company. Foresman, T. (1997). The history of GIS, Prentice Hall. French, S., & Skiles, A. (1996). Organizational structures for GIS implementation. Proceedings of the 1996 Annual URISA Conference, 6, 280-293. Haack, C. (2002). What’s your plan? : An argument for strategic planning. Proceedings of the 2002 Annual URISA Conference. Holdstock, D. (2017). Strategic GIS Planning and Management in Local Government, CRC Press, ISBN: 978-1-4665-5650-8. Kuhn, W., & Onsrud, H. (Eds.) (2015). Advancing Geographic Information Science: the past and the next 20 years. GSDI Association Press, http://gsdiassociation.org/index.php/49-capacity-building/publications/343-advancing-geographic-information-science-the-past-and-next-twenty-years.html. Kouyoumjian, V. (2011). GIS in the Cloud. E-book from Esri. http://www.esri.com/library/ebooks/gis-in-the-cloud.pdf. Mintzberg, H. (1979). The Structuring of Organizations, Prentice Hall. Nedovic-Budic, Z. (chair) (2005). 2002-2004 Report and Recommendations, URISA National Geographic Information Cooperation, Coordination, Collaboration Task Force (3CTF). Obermeyer, N., & Pinto, J. (2007). Managing Geographic Information Systems, 2nd Edition, Guilford Press. Pearlson, K., & Saunders, C. (2006). Managing and Using Information Systems: A Strategic Approach, John Wiley and Sons. Scassa, T. (2013). Legal issues with volunteered geographic information. Canadian Geographer, 57(1), 1-10. Scott, J. (2005). The Concise Handbook of Management: A Practitioners Approach, The Haworth Reference Press. Somers, R. (1994). GIS organization and staffing. Proceedings of the 1994 Annual URISA Conference, 6. Somers, R. (2000). GIS strategic planning. Proceedings of the 2000 Annual URISA Conference. Somers, R. (2004). Moving up to an enterprise GIS: Making a successful transition. Proceedings of the 2004 Annual URISA Conference. Tomaselli, L. (2007). The enterprise model of GIS, and the implications for people and organizations. In Joshi, R. and Seshagiri, S. (Eds.) Geographic Information Systems: Management and Technology Perspectives. SBS Publishers. Tomlinson, R. (2013). Thinking about GIS: Geographic information system planning for managers. Fifth Edition ESRI Press. UNGGIM (2015). Future Trends in Geospatial Information Management. Special report by the United Nations Committee of Experts on Global Geospatial Information Management, 2nd Edition, December, 2015. http://ggim.un.org/knowledgebase. Wellar, B. (editor) (2012). Foundations of urban and regional information systems and geographic information systems. Special URISA publication.